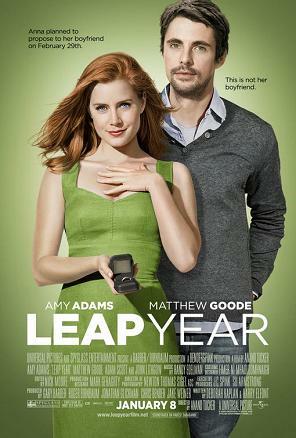 Leap Year is a nice sweet romantic comedy of Anna (Amy Adams) wishing to follow an Irish tradition and propose to her boyfriend on leap day (2/29) while he is at a business trip in Dublin. Things go wrong when bad weather kicks in and she is forced to land somewhere else. She manages to make her way to the Dingle Pennisula, where she asks a cynical local innkeeper Declan (Mathew Goode) to drive her from the countryside to Dublin, who initially refuses and constantly ridicules her on her idiotic behave. What happens next is easy to guess. The movie is a minor letdown if it weren't for Amy Adam's and Mathew Goode's great performances. Since Amy Adam's great performances in Junebug and Enchanted, I've been following her work. Here, she plays the sweet but determined woman again with great effectiveness. Mathew Goode is not recognizable from his part as the villain Adrian Veidt / Ozymandias in Watchmen, but he is equally convincing and good as the arrogant guy who constantly mouths sarcasm towards Anna but cannot help falling in love with her later on. I don't want to interrupt a good party, but l want to say thank you to my husband. I want to say, may you never steal, lie or cheat. because I couldn't live a day without you. "I want to say, may you never steal, lie or cheat. because I couldn't live a day without you."